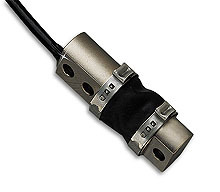 The model LCDA is a versatile bending beam load cell for tension and compression loading. Compact and low in profile, the LCDA is ruggedly constructed of high quality alloy steel to provide maximum durability in industrial applications. Each unit is nickel plated for corrosion resistance and sealed to resist moisture.